This project aims to assess the narratives surrounding environmental issues, grounding them in both historical and present-day context. Oftentimes environmental narratives are “lost” in one direction or the other—or co-opted by less-than-factual accounts—and their study can help us better communicate regarding environmental issues. Consider just a few of the very important narratives we hear about on a regular basis: jobs versus the environment; political party views of the environment; religion and the environment; the benefits/harms of GMOs, government overreach versus valuable public services; the benefits/harms of fracking public versus private rights; and, of course, virtually everything you hear about climate change. Study of these narratives is important so that we can better communicate important environmental issues and lessons to both students of environmental law and policy the general public. This site will be a repository of case studies and associated teaching/research materials for academics and other professionals, so that they can gain insight into how environmental narratives are won, are lost and/or do not match the facts/reality. The more we invest in understanding, talking, teaching and researching these case studies/narratives, the better equipped we will be to properly message, to “win” the narrative, and to “understand the other side” so that we can more effectively bring about environmental change. California’s energy transition is in full swing and the Golden State seems willing to set an example for the rest of the world. Yet, some of the downsides of the transition receive far less attention. The most notable omissions include the environmental and social impacts generated by mining industries. These downsides are not only unfair to miners and harmful to the planet, but they are often used by business-as-usual advocates to undermine the efforts of ‘transitioners’. A better way to proceed? : engage in a more holistic discussion of costs, benefits and precautionary concerns. Since 2015 and the Paris Accord there has been unprecedented momentum for climate action. Yet despite international efforts (only Nicaragua and Syria haven’t signed the agreement), it is at the local and regional levels that the momentum is the strongest. Some 700 mayors across the world have agreed to transition to 100% renewable energies by 2050 at the latest. In the US alone, several states (Hawaii, California, New York, New Jersey) have also pledged to reduce their emissions drastically. This mobilization has been made even more visible and urgent after Donald Trump’s election in 2016 (and his decision to pull out of the Paris Accord) or more recently by that of Bolsonaro in Brazil. All eyes are now turned to cities, districts and states. California is playing an important role in that regard. California has forged the reputation of being the nation’s greenest state. In California Greenin’, How the Golden State Became an Environmental Leader, David Vogel traces the history of environmental regulations in the state and shows that from the 1860s onward it has consistently pushed for more, from the 1864 decision to create the first publicly protected wilderness areas in the United States, to one of the very first environmental laws passed in the country (i.e. the banning in 1884 of hydraulic mining), to the 1964 emissions standards to curb vehicle emissions, and again to its fight against climate change beginning in the early 2000s. Not only have these regulations been effective in California, but they have created what David Vogel calls the “California effect”: the impact that California has had in influencing and reinforcing environmental protection beyond its borders. A case in point would be the 1977 auto emissions standards that contributed to the 1990 Clean Air Act Amendments and the application of the California standards nationwide. Since the last presidential election and the rolling back of numerous environmental regulations by the Trump administration, Governor Jerry Brown has been presented as a “climate hero.” In September 2018, by signing SB100 Governor Brown pledged to decarbonize California’s economy and to lay the foundations for 100% renewable energy by 2045. Of course this is easier said than done, but as Daniel Kammen says, SB100 “establishes a framework against which we can measure our investment in the future.” And if the fifth largest economy in the world and its 40 million inhabitants succeed, the feasibility of such a large scale project will be proved. California is arguably a testing ground for the rest of the world. Of course the challenge is significant. While each year the energy package of California incorporates more renewables, it still relies on fossil energies for 47% of its consumption, on large hydro for 15%, nuclear for 9% and, to add to the woes, its electricity sees an increase of GHG emissions in periods of drought and its transportation emissions are still on the rise. California is still a long way from running on 100% renewable energy, but it is making the necessary efforts and showing the way. A thorough list of these efforts would be too large to compile. But let’s highlight a few significant ones. In early 2018, the California Air Resources Board said that California, thanks to its investments in improving efficiency and in developing renewables, had managed to reduce its gas emissions to 1990 levels and had done so four years ahead of schedule. 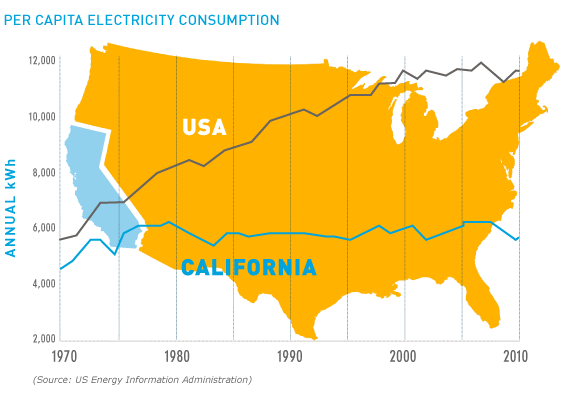 The average footprint of a California citizen (10.8 metric tons per person) has been reduced by 23% in the last 10 years and is now two-thirds of the national average (15.53 metric tons per person). This is much better than Canada’s (15.32) and Australia’s (15.83), but not up to Germany’s (8.93) or France’s (4.37). And the icing on the cake is that it has done so by boosting its economy, thus debunking the myth that the ecological transition can’t happen without putting a dent in the economy. To this positive narrative one could add that some thirty cities and the ten University of California campuses have committed to 100% renewables by 2025 or 2035 and that mobilization is occurring on all levels: from grassroots movements to the California government. The global effort to transition to renewables thus gives rise to a positive narrative: renewable energies are clean, sustainable, job-creating and have a positive impact on our health and on the environment. And this is confirmed by the latest research on the impact of renewables as opposed to those of fossil fuels. Indeed, life cycle analyses confirm these narratives. For example, a recent study shows that in terms of pollution there is no match between fossil fuels and renewable energies: “Replacing fossil fuel power plants with renewable energy sources, including solar, wind, hydropower and geothermal power, would reduce diverse types of pollution. The magnitude of difference in pollution between fossil and some renewable energy options is stunning.” Numerous other studies come to the same conclusion, so we can safely conclude that the social and environmental benefits of renewables are important. Yet, a closer (and comprehensive) look at this positive narrative is likely to cast a more nuanced light on the transition. Prominent advocates of the energy transition in the US rarely, if ever, speak about the environmental and social issues that lie behind the energy transition. For example, none of the 30 or so cities in transition in California mention this parameter in their Climate action plans. Advocates of the energy transition, be it Mark Jacobson from UC Stanford, David Hochschild (Commissioner California Energy Commission), or Governor Jerry Brown, never deliver the rest of the story. And the same phenomenon occurs on a national level. I never hear people like Bill McKibben or Michael Mann talk about the environmental and social impacts of the energy transition. Now, don’t get me wrong, these scholars, politicians and activists are doing a tremendous job and I am all eyes and ears when they promote the energy transition. But, let us stress that solar panels, wind turbines, electric cars, in fact every single renewable energy sector, needs a certain amount of raw materials to develop. The energy transition is rooted in the ground. Solar panels require lanthanum, wind turbines neodymium and dysprosium, electric cars lanthanum, cerium, yttrium and dysprosium, and so on. These technical terms are also known as “rare earth elements”, or REEs. Where do they come from? Is their extraction “clean” and does it give rise to a positive narrative as well? (See, for example, Mining North America: an Environmental History Since 1522, by John R. McNeill and George Vrtis). In her groundbreaking book, Julie Klinger says that “currently, rare earths elements are mined and processed in ways that generate tremendous harm to surrounding environs and their inhabitants… Cancers, birth defects, and the decomposition of living people’s musculoskeletal systems: these constitute an epidemiological crisis affecting some two million people in northern China…Southern California, Malaysia, and Central Asia.” The same could be said about cobalt (a raw metal also used for renewables) in Congo or lithium (used for batteries) in Argentina, and a number of other raw materials that are extracted across the globe, but more particularly in developing countries. The global trend in the last 30 years has been to close mines in developed countries and open others in developing ones. Why? Because of competition (labor is cheaper in developing countries) and because of a lack of environmental and social regulations that, again, make it noncompetitive in some places and competitive in others. In this regard, the story of Mountain Pass in California is illuminating. From 1965 to 1985 the mine of Mountain Pass in southeastern California was the world’s biggest producer of REEs. Run by Molycorp until the 2000s, the mine produced lanthanum, cerium, neodymium, praseodymium, yttrium, europium and samarium. Mountain Pass lost ground in the mid 1980’s for at least two reasons. First, the Chinese market kicked in and second, a series of environmental disasters gave rise to stricter environmental regulations. An investigation found that some 60 spills occurred from the mid 1980’s to the late 1990’s, the equivalent of 600,000 gallons of wastewater poured onto the desert floor near Ivanpah Dry Lake. As a result Molycorp was forced to pay $1.4 million in fines and settlements to the San Bernadino Country district and to slow operations dramatically. Since then, the mine has gone from closure to reopening and the production of rare earths has decreased despite significant resources. (See, for example, The Rare Earth Project Index, which lists Mountain Pass as one of the 58 rare-earth mineral resources with good potential outside China). The story that looms behind Mountain Pass is a story of delocalization of both labour and pollution. The stringency of environmental regulations contributed to the reterritorialization of the industry in less stringent areas; China mostly in the case of REEs. Hence, the environmental and social burdens have followed the road, and ended up in regions like China’s Inner Mongolia or the province of Jiangxi. In Inner Mongolia, both the extraction sites in Bayan Obo (known as the world’s capital of REEs) and the sites where rare earth are processed (i.e. 80 miles south in Baotou) are sadly famous for their very intense pollution. From foul air to polluted groundwater, farming soils made sterile and river pollution, Inner Mongolia has borne almost by itself the brunt of the transition to green tech and renewable energies. The first has to do with decency: we cannot brag about being green and at the same time delocalize our pollution. Doing this is nothing short of perpetuating a ‘Not In My Backyard’ mindset. To the extent possible, the transition should strive for minimum environmental and social impacts and ‘Not In Anbody’s Backyard’ practices, and solutions should be found both locally and globally. Second, while ignoring the whole story, the advocates of the transition are likely to undermine their own efforts, for the pro-fossil fuel groups may use (and actually are using) these arguments to slow the transition and put their industries in a good light. Third, the latest report of the IPCC, published this Fall both highlights the dire situation we’re in and indicates that we have a 12-year window to implement rapid changes and limit the rise of the temperature to 2.7 degrees Fahrenheit (1.5 degrees Celsius). We have no time to waste in debate. It is time to mobilize and act efficiently. And California, as our preliminary remarks have shown, has historically succeeded at doing so. – Telling the whole story to citizens is the first step. We should have access to the traceability of the products we buy so as to be able to make the connection between consumer goods and natural resource extraction. Phones, electric cars or electric bikes could be sold with their life cycle analyses provided to consumers; rooftop solar panels could also be labeled, etc. – Mining industries should be constrained to enforce environmental and social regulations in every country, and governments should play a role in that regard. – Reopening mines under stricter regulations in developed countries should also be addressed. Why not relocate the production of raw materials, stop deterritorializing our pollution and deal with our own issues at home? As far as REEs are concerned and according to The Rare Earth Project Index, 5 of the 58 rare-earth mineral resources are situated in the US and many more deposits have been found across the country. – There should be bigger investments in the recycling of rare earth minerals and other metals necessary for renewable energies. – And last but not least, sobriety should be promoted by incentivizing all citizens (with a stronger insistence on big emitters) to reduce their own carbon footprints. Now of course, all these propositions are most relevant in a world willing to make the transition to a net-zero economy, they would be less so in a climate-destroyed world. But in the first case and to ensure a just transition, every single stakeholder has a role to play, and by working with all the parameters of the transition, we are likely to do a much better job and stand up to all the challenges inherent to the energy transition. This fall and last have seen a series of historic hurricanes pummel southern states and Caribbean islands. The 2017 hurricane season in particular was “record-shattering.” In August 2017, Hurricane Harvey killed more than 60 people, flooded Houston, and swamped coastal towns when it hit Texas. Hurricanes Irma and Maria followed that same month, with Maria devastating Puerto Rico and killing thousands. Hurricane Nate then also hit the southern United States and Mexico, killing dozens. The U.S. South is a complex and often misunderstood region of the country. Though election maps show regions of the nation as either red or blue—most often at the state level—a deeper look reveals a mix of political values (Figure 1). To say that politics has become ‘divisive’ or ‘sectarian’ in recent years is now a truism almost not worth stating any longer. News sources are replete with references to ‘tribalism’ and ‘polarization’; ‘populists’ are pitted against ‘elitists’ and accusations of ‘fake news’ fly in all directions. The result appears to be a society split into two irreconcilable camps which have neither the ability nor the desire to engage the other meaningfully. While these camps share a common interest, particularly when it comes to environmental issues, one reason for the schism are the narratives formulated, often on the same topic, by both sides of an issue. Sometimes one side’s narrative is more effective than the other, and scoring a narrative “win” (whether in line with the facts or not) helps shift public perception in a way that harms environmental goals.